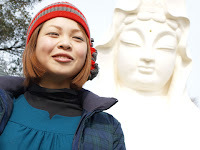 As we share an interest in Buddhist art, I've sent an email to Ikumi Hirose. I first learned about the 29-year old graduate of Tokyo's Sophia University last week in the English edition of the Yomiuri Shimbun. As a young woman working in a field commonly tended by balding, bespectacled scholars, she's something of a curiosity, and by coining a name for herself she helped the media sell her to the public. As a result she has become something of a minor celebrity, the Butsuzo Girl. The Buddhist Statue Girl. Hirose's written a book about some of her favorite statues and while on her travels to learn more about Japan's art legacy gives talks or lectures discussing some of her interests. The media dutifully turn up to these events not so much because everyone is suddenly interested in Buddhist statuary as they are in catching a glimpse of the Butsuzo Girl. I'd care not so much for a glimpse as for a chance to talk and maybe visit some temples or a museum together. I hope my message wasn't filtered into her spam folder. For those that might be interested, you can check out Ms Hirose's website here. The Yomiuri article is linked above. Hello, do you know when the book was published?